Oran started driving back to Mubarraz on his new job Monday morning, but, at least, this would be a short work week for him. Things were beginning to change for our group as a whole, both men and women. Sheila went to work at Community Maintenance, and Marge and Marvin Williams were going to move to Udhailiyah. The company had finally started to move families down there. Besides the swimming pool, a construction camp of portable family homes had been built, and one street of free-standing brick homes were under construction. However, Marge and Marvin would be living, temporarily, in one of the old rowhouses that had been fixed up. She was in Udhailiyah for a couple of days to check on that, but came back Wednesday, February 23rd, 1977, so we went to breakfast again at the Dining Hall. Estella and Avonie joined us, and we talked about all the new activities and Marge's move to Udhailiyah soon. None of us knew for sure which one of the wives might be the next to join her there. After that, Marge and I drove to Sandy's, Kathi’s, and to the Community Maintenance Building to see Sheila’s office. We made our final plans with her to go to the Barbara Mandrell Show and Dance that night at the School Gymnasium. I had my hair fixed after that, then had tea in the snack bar with Estella. We went to the Commissary, then to my house, where we talked about the dance some more. Everybody was really getting excited, and everything seemed just fine then. Oran came home, joined us for awhile, but then rested. After Estella left, I went to the Steindorf's, then to the Dining Hall for shrimp. Oran had joined us by then, so we all went to the school gym for the evening's festivities. Boy, was it crowded, as was usually the case when a big name performer came to Arabia, and Barbara Mandrell was a "biggie". The company decided they had better let even the bachelors come to this one, and they were there in droves. Estella, Avonie, Pensi Pate and their usual group of bachelors were there together, plus some who had come up from Udhailiyah that they had asked to sit at their table. She hadn't even mentioned that when we were together all afternoon. Her husband, Bill Syphers, was weekend foreman in Udhailiyah, so he couldn't even attend. All of our husbands had to take turns, so it was just luck of the draw. On one of my trips to powder my nose, Estella asked me to sit with them for awhile, so I did until Norm Wade, one of Oran's bosses, came over to ask me to dance. When that was over, I returned to my own group's table. The show was very good, and everyone seemed to have a smashing good time. The next morning, I had to go to the Recreation Center to check on something for the bowling tournament coming up the next weekend. I ran into Estella, so we had coffee together in the snack bar, and talked all about the dance the night before. Then she said she was giving a party that night at her house for all the people she had been sitting with at the dance. She invited us to join them, but we just didn't feel up to it. Things were never quite the same with her after that. We went to the Dining Hall for breakfast at 9:30 Friday with our group. 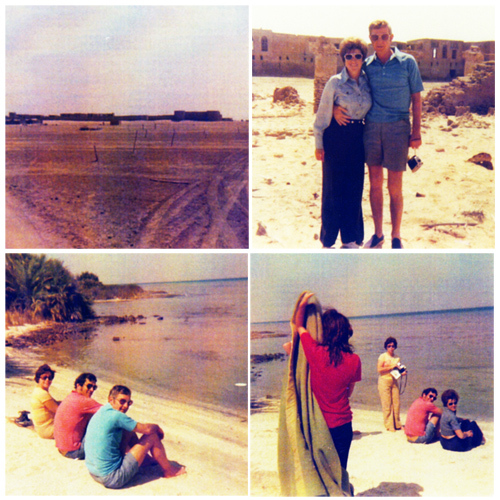 Earlier we had heard about an old Turkish Fort at Uquar, on the beach about 23 miles south of Qurrayah; so we had decided to go there that day with the Williams and Adams. We rode in the Adams old Volkswagon station-wagon we called the "Mumblesmobile", and hoped we could make it. We left Abqaiq out the back gate on the road to Qurrayah, but about 3/4 of the way there, turned off to the right on a road that was little more than packed ruts in the sand. Although difficult at times, we persevered and finally came to a bay with some scrawny palm bushes sparsely dotted along it's edge. We continued to follow the ruts around the south side of the bay to the main water of the Persian Gulf, and there it was, the ruins of an old Turkish Fort that we had heard was Arabia's first port of entry. It seemed deserted, so we started walking around taking movies and pictures, but after awhile came upon a couple of uniformed soldiers. They told us it was forbidden to take pictures, so we put our cameras away, and fortunately did not have them taken from us. We were told by the soldiers that the fort was a military installation, which furnished us with laughs for a long time, as it was such a run down, deserted structure at that time. But you had to follow their laws and rules, or perhaps end up in jail. It was part of Saudi Arabia's history, though, so we were fortunate to be able to go there. Turkish Fort at Uquar; Colleen and Oran Wilson in Fort; Marge and Marvin Williams with Oran on the Persian Gulf; Sandy Adams holding a blanket, Marvin and Colleen sitting. On the way back to Abqaiq, we stopped at a nice looking, smooth, white sandy beach about halfway around the bay's edge. We spread a blanket on the ground, gathered dry camel bush limbs, built a small fire, and roasted wieners, heated beans, and enjoyed the lovely weather, while eating the meal we had prepared.After awhile, we drove on back to Abqaiq without any mishaps. It had been a very different and interesting day. Saturday, February 26th, 1977, started the usual work week for Oran again, and my usual activities with the women. I tried to do as much as possible with Marge Williams before her move. We had gotten very close lately and had done a lot together. I was really feeling sad about their going, and would miss her extremely. We did talk about plans for me to fly down to visit her, and for Oran and I to fly down to stay with them when they had the A.E.A. entertainers there. And we made plans for them to fly back to Abqaiq, stay with us and do things there, so that made us both feel a little better. The only different thing I did that week was go to a bridge luncheon at Marie Eggleston's. Her husband worked for the Sante Fe Drilling Company, like Jim Morris, but they lived in Mansour Camp. Thursday, March 3rd, I was involved in a scratch bowling tournament in Dhahran as part of the Abqaiq team. So I met with Estella and the other bowlers in the Dining Hall for breakfast in Abqaiq to begin with, then we all caught the 9 o'clock bus to Dhahran. It was a long, tiring day, as I didn't bowl every game, so just had to sit around a lot, and I didn't do well when I did bowl. My mind wasn't totally on the game, as I also had to catch the 5 o'clock bus back to Abqaiq to go to the farewell party for Marge and Marvin, given that night at the Adams. I did enjoy that, but had to leave early, as I was going back to Dhahran again the next day to continue in the tournament. I went to the Dining Hall for breakfast with Estella and the other bowlers again Friday morning, then caught the bus to Dhahran. I ended up not bowling at all, so it was another long, tiring day, and all for nothing, really. I wished I had not gone at all. I finally walked around Dhahran some and ran into some friends from Abqaiq, so I rode with them to Al-Khobar and to see the Dhahran Beach facility. Even that didn't cheer me up like it usually did. I caught the 5 o'clock bus back to Abqaiq. Oran had weekend duty (on-call), so he had to stay at home near the phone. It gave him a chance to catch up on some reading, paper work, and needed rest. We went to the Dining Hall to eat dinner, and he said even that was a welcome relief from the peanut butter sandwiches he had fixed himself all weekend. The next week there were more social activities for the Williams last week in camp. There was a luncheon for Marge at Norma Branch's Saturday, March 5th, and on Wednesday morning I helped Kathi with a brunch for her. Wednesday night all of our group met at our house for drinks before going to the Dining Hall together for fried shrimp one last time, before their move to Udhailiyah. There was another A.E.A. 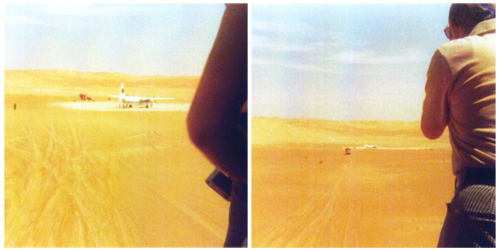 trip Thursday, March 10th, 1977, to the Rub-Al-Kali, the large area of southern Arabia that is uninhabitable, but also had oil, so there were wells and a Drilling Camp there. Our 1 hour, 45 minute flight down was nice, and we landed on another, small, black asphalt airstrip, surrounded by extremely huge, red sand dunes, almost like mountains. There were no rigs or camp in sight, which was an unexpected surprise. So we were literally herded onto the open back of big flat bed trucks, with slatted sides, and driven, or I should say, bounced, up over the extremely huge dunes, on nothing but tracks in the sand, not even a road. Oran taking pictures of the plane leaving. As the plane receded in the distance, we got a sinking feeling in the pit of our stomachs, but tried to make the most of it by joking and taking pictures for awhile. The wheels were whipping sand into the back of the truck, stinging our skin, and we were being jostled around dangerously. Oran even got a bad cut on his arm when he was thrown up into the air, then thrown against the slats on the side of the truck when he came back down. Other people got bruises. After that, everyone just huddled down in the truck, trying to protect themselves the best they could. 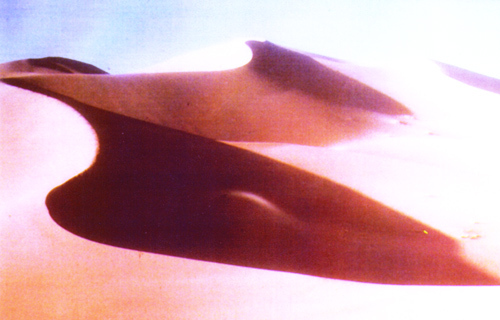 We rode like that for an hour, up and down over the huge, red sand dunes, sometimes with the trucks leaning precariously one way or the other as the sand slid out from under the wheels on a sideways incline. When we arrived at the rig campsite at last, we discovered it was in the process of being dismantled to move elsewhere, so we couldn't even go into it, not even to use the bathroom or get a drink of water. We hadn't been told about that, just to bring a sack lunch, so we just sat down on the sand and ate that. We would never have left the plane if we had known. Some people wandered around a bit afterward, collecting the unusual red sand in small viles that had been given each of us, but Oran and I were so upset and disgusted by the whole turn of events by then, that we could have cared less if we ever saw that red sand again in our lives. This was turning out to be one of the worst experiences we ever had while living in Arabia. It was soon time to return to the plane, but before we left, Oran talked the truck driver, who was one of the oil workers, into letting me sit in the cab with him going back. But Oran and everybody else had to endure another hour of the same hot, dirty, and dangerous ride. There was nothing to see either, but red sand, as far as the eye could see, not a blade of grass, not a bush, not a palm tree, not even a camel. As the trucks topped the last huge sand mountain, the sight of the plane on the black airstrip down below was a beautiful sight. We hurriedly boarded and took off, but the plane was no sooner in the air headed for Abqaiq, than it started turning back toward the airstrip. We were all alarmed, but were told we had to go back to pick up 3 of the oil workers, who had arrived shortly after we took off. I don't blame them for being anxious to get out of that place. Talk about isolated. Udhailiyah was heaven in comparison. We landed, picked up the men, then the plane took off again in the wrong direction, not even bothering to taxi to the far end of the strip again. Either the wind had changed or the pilot was just in a hurry to get us on our way again, I don't know which. Anyway, after another hour and 45 minute flight, which was a little bumpy, we landed at the Abqaiq airstrip, tired, sore, and dirty, but glad to be back home in one piece. After a shower, I got my hair fixed before we went to Marge and Chris DeSantis' for dinner and bridge. What a day.